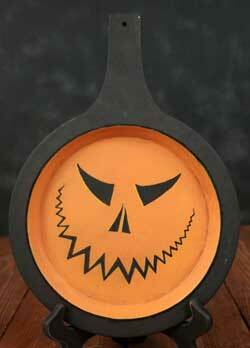 Decorative plates, trays, and bowls for your primitive, country, or folk art halloween displays! From Hearthside Collection, Your Heart's Delight by Audrey's, plus one-of-a-kind hand painted in the USA options! 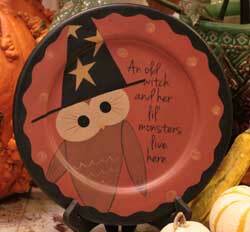 An OlThis darling plate features a painted owl wearing a witch hat, and reads: "An old witch and her lil' monsters live here." A Michelle Kildow design. 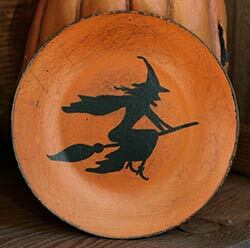 This round wooden plate is entirely hand-painted, using a free-hand design. Features a spooky bat flying over a crescent moon. 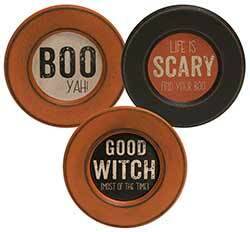 This set of three primitive wooden plates feature quirky Halloween phrases, and a color palette of oranges and black. 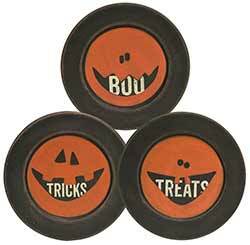 This set of three primitive wooden plates feature quirky jack o'lantern faces, and a black and orange color palette. 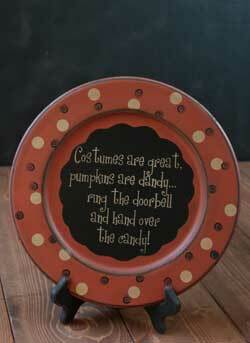 Candy Corn Halloween Plate, by The Hearthside Collection. We love this beautiful primitive plate! Around the tan border is a painted berry vine, dotted with candy corn. 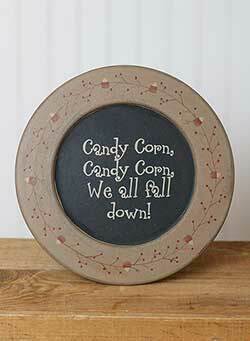 Candy Corny Primitive Wood Plate, by The Hearthside Collection. A Michelle Kildow design. Measures 9.5 inches. Made of hand-painted pressed-wood, aged and distressed for a rustic look. Decorative use only (not food safe). Plate stand also available (sold separately). Reads: "Witch way to the candy?" Background is a smoky grey. Measures 6 inches. Painted and distressed plate with jute burlap pennant accents. This one has a grey background and says FALL. 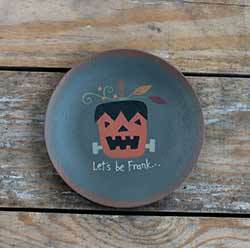 Add a spooky touch to your primitive halloween decor with this painted wooden plate, featuring a Frankenstein monster Jack o'Lanter, and reads: Let's be frank." A super-fun accent for halloween, this spooky Jack O'Lantern face is painted on a decorative wooden skillet, with a jute string for hanging. 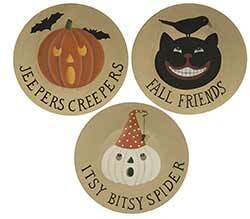 Perfect for primitive Halloween decorating, this wooden plate set is painted with three different retro style creepy critters, each with a different phrase. Hand Over the Candy Plate, by The Hearthside Collection. A Michelle Kildow design. Measures 11.25 inches. Made of hand-painted pressed-wood, aged and distressed for a rustic look. Decorative use only (not food safe). Plate stand also available (sold separately). 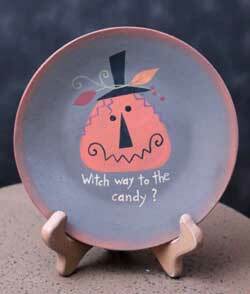 Happy Candy Day Plate, by The Hearthside Collection. 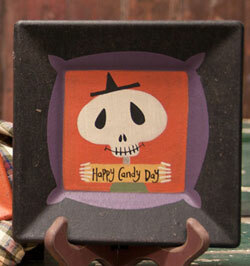 This darling skeleton plate features a black, orange, and purple color palette. Reads: "Happy Candy Day." A Michelle Kildow design. Measures approx 6 inches square. Made of hand-painted pressed-wood, aged and distressed for a rustic look. Decorative use only (not food safe). Plate stand also available (sold separately). 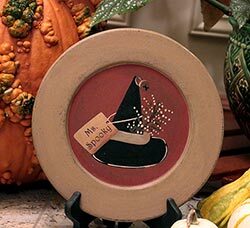 Perfect for primitive Halloween decorating, this wooden plate is painted with a grinning Jack o'Lantern wearing a witch hat. 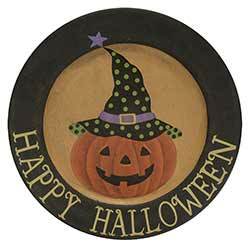 Lettering along the black rim reads "Happy Halloween." A Michelle Kildow design. Measures 5.25 x 13.5 inches. Reads: "I love candy this much!" A Michelle Kildow design. 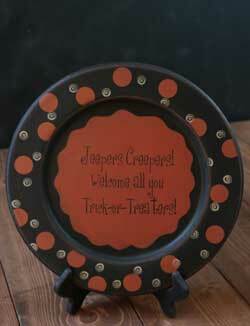 Jeepers Creepers Plate, by The Hearthside Collection. A Michelle Kildow design. Measures 11.25 inches. Made of hand-painted pressed-wood, aged and distressed for a rustic look. Decorative use only (not food safe). Plate stand also available (sold separately). 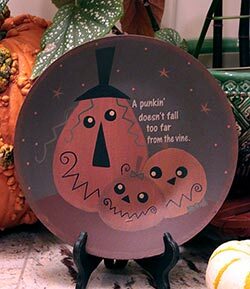 This darling plate features painted orange pumpkins, and reads: "A punkin' doesn't fall too far from the vine." 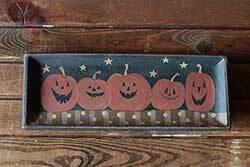 This primitive wooden oval plate features a garland of tiny pumpkins and candy corn, and reads Happy Halloween. 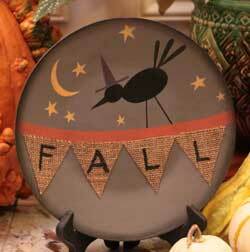 Painted and distressed plate featuring a black witch hat and little tag that says "Ms. Spooky." 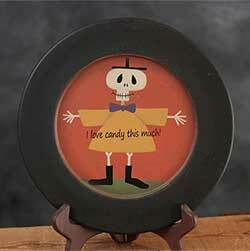 Add a spooky touch to your primitive Halloween decor with this painted wooden plate, featuring a mummy monster Jack o'Lantern, and reads: Mum's the word. 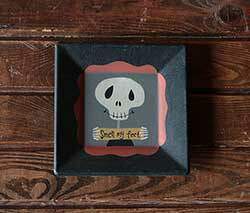 Perfect piece of artwork for a Halloween accent! 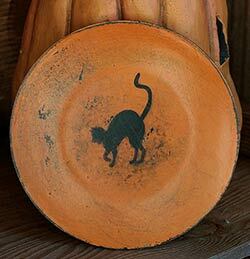 Features a hand-painted black cat on an orange background, sanded back to reveal black underneath and around the rim. 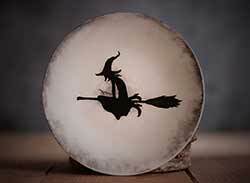 Features a hand-painted black flying witch silhouette on an orange background, sanded back to reveal black underneath and around the rim. Measures approx 6 inches. 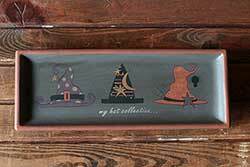 This Halloween Tray is painted a vanilla cream color and has vintage style lettering accented with crows, and a jack-o-lantern wearing a witch hat. 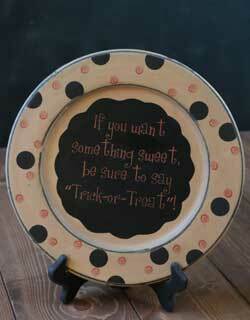 This Halloween Tray is painted a vanilla cream color, with vintage style lettering in greyish blue. Accented with bats and a jack-o-lantern. 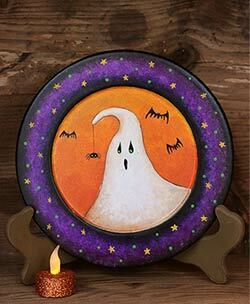 Spooky and sweet, this hand painted plate will add a unique touch of Halloween folk art to your home, perfect for a shelf, mantel, or place on a hanger for wall decor! 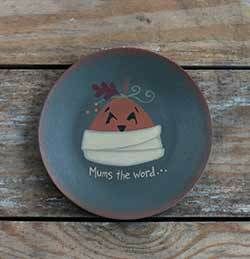 Plate is entirely hand-painted to order, using a free-hand, exclusive design. 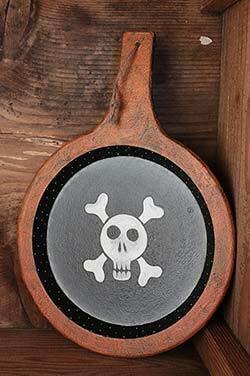 This rustic wooden skillet is entirely hand-painted, featuring a skull and crossbones in shades of white and black, against a background of mottled grey. The border is crackled pumpkin orange with black showing through, and the inner rim is black with tiny hand painted grey polka dots. 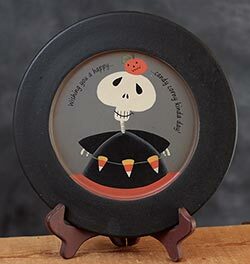 This darling skeleton plate features a black, orange, and grey color palette. Reads: "Smell my feet." 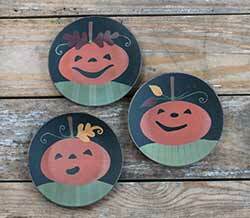 This darling plate set features a painted orange pumpkin with a sweet face. Measures approx 6 inches. 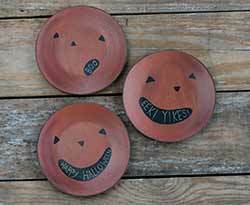 Set a spooky cute tone in your home with this set of three decorative wooden plates, featuring quirky jack o lantern faces, each "talking" with a different Halloween quote: "Boo," "Happy Halloween," and "Eek! Yikes!" 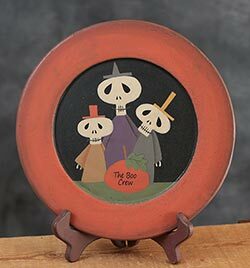 Boo Crew Primitive Wood Plate, by The Hearthside Collection. A Michelle Kildow design. Measures 9.5 inches. Made of hand-painted pressed-wood, aged and distressed for a rustic look. Decorative use only (not food safe). Plate stand also available (sold separately). 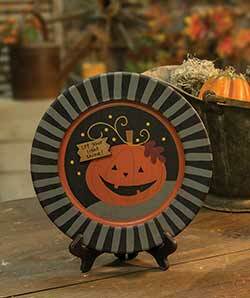 Trick or Treat Plate, by The Hearthside Collection. A Michelle Kildow design. Measures 11.25 inches. Made of hand-painted pressed-wood, aged and distressed for a rustic look. Decorative use only (not food safe). Plate stand also available (sold separately). 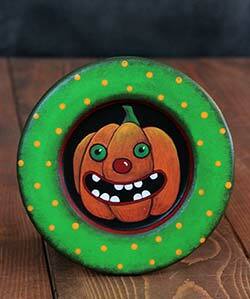 Features a vintage-inspired Jack o'Lantern against a black ground, with a mottled lime green rim and light orange polka dots. Measures approx 6 inches in diameter. 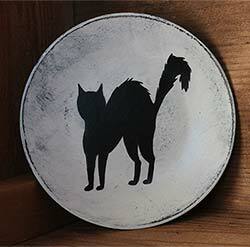 Features a hand-painted black cat on a white background, sanded back to reveal black underneath and around the rim. Measures approx 6 inches.